Apple Macintosh 1984 Commercial Gets LEGO-ified. Apple cascaded its way into the public psyche with its famous 1984 commercial, directed by Ridley Scott. 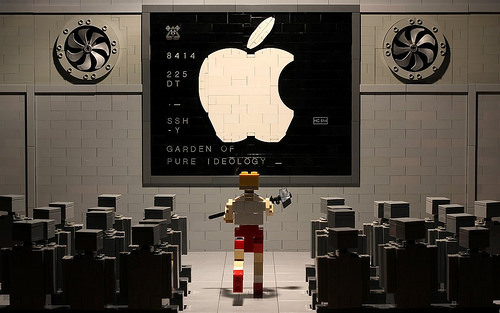 Jason Allemann’s wonderfully poignant LEGO version re-imagines the work with Apple itself as the all-seeing overlord. Whatever side of the fence you sit regarding Apple’s business these days, this is a fantastic piece. But this is a Lego site. Apple / android fandom has no place here. 95% of the population don’t care, and the rest see something important in a minor aspect of everyday life. Fine to show great builds either way, but the commentary on maps and bendiness is inappropriate. Maps is fixed in seconds by downloading Google maps, and the whole bendiness thing was a small number of users, much like antennagate.